These women fought their way out of poverty, crisis, and trauma with the help of Haitian Families First programs. Now, they are leaders in their community and dedicated staff members of Haitian Families First. When Clercine found out she was pregnant, her employer threatened to fire her if she didn’t send the baby to an orphanage. She was forced to choose between keeping her well paying job as a nanny and losing her baby. Her husband was unemployed, making the choice even harder. Ultimately she chose to devote her time to her children rather than her employer, opting for an uncertain future and almost certain poverty. Clercine and her husband even took back their four- year old son they had sent to live with an aunt. Their family had doubled, but their jobs had vanished. Haitian Families First helped stabilize Clercine’s life by enrolling her children in the nutritional and educational programs, but saw Clercine’s leadership potential. She had worked in people’s houses, so they hired her to run the home of Haitian Families First’s American staff—a very busy place. Clercine also cares for clients’ children while their parents take classes and supports families whose loved ones are receiving medical care. On weekends, she heads home to be with her husband and children. Clercine and her husband were able to keep their daughter and support the son they were once too poor to raise. Both children are going to school in the hope of an even better tomorrow. In 2010, Jeta came to Haitian Families First in a state of crisis. This mother of two was struggling to feed her 18-month-old son, Kervens. Her partner had just left her, and she had lost her job. She didn’t want to give up Kervens—she’d already endured a painful separation from her daughter, whom she placed with a family in Port-au-Prince. Haitian Families First was determined to give Jeta a chance to become self-sufficient and keep her son. The organization enrolled her children in its Educational and Health and Wellness programs so the children could go to school and see the doctor. Working with Jeta, Haitian Families First discovered that she was their perfect jack-of-all-trades, able to comfort sick children while advocating for their care. Haitian Families First quickly hired her. She nannies the children in Haitian Family First’s temporary care, and she spends hours in the hospital comforting abandoned infants until Haitian Families First can find a home for them. She also works with families, encouraging those with new babies and providing meals for those visiting Port-au-Prince to get medical care for their children. Not only is Jeta dedicated to Haitian Families First, but she is once again able to feed Kervens and has gotten her daughter back. 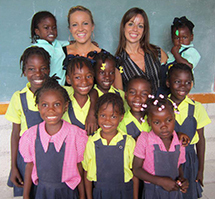 Jeta inspires other women at Haitian Families First to overcome their own crises. Junia had left her abusive husband, so she was alone when she lost her job. As a cook at a beach resort, she had been supporting two daughters, but when she was suddenly fired she thought she would have to institutionalize one of them. Junia thought she had no other choice: she didn’t see how she could look for a job while supporting two children. Junia discovered Haitian Families First when she was looking for work, and realized that, through their Educational and Health & Wellness programs, she could support her children enough so that she could keep them. Despite Junia’s challenges, her community spirit impressed Haitian Families First. She created a support network of women to help each other with family problems. This tight-knit group helped an aunt raise a baby whose mother died in childbirth. After seeing Junia’s capacity to lead her family and her community, Haitian Families First hired Junia. She distributes supplies, conducts needs assessments, and works with hospital staff. She also lives her work, and has recently adopted a third child. Jeremie’s mother died in childbirth, and she didn’t know who the father was. Jeremie was a dangerous 2 pounds when Junia adopted him, but in her care he quickly put on 10 more. Working with children had been Junia’s lifelong dream, a dream Haitian Families First’s programs helped her live out.